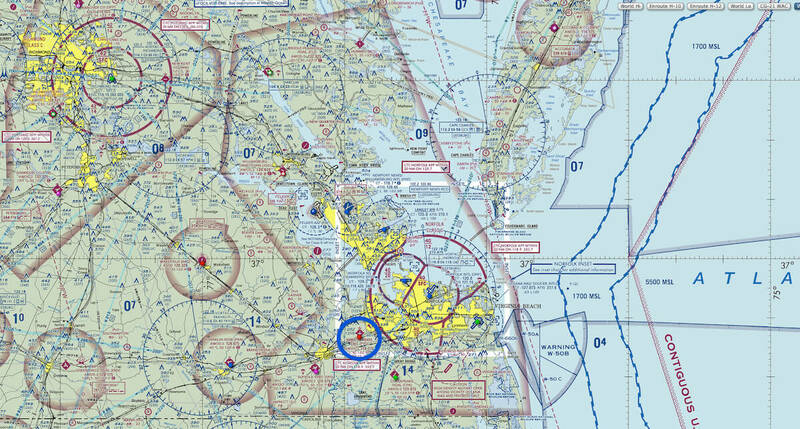 Did you ever hear of Hampton Roads Executive Airport or ICAO code KPVG? I didn’t, but that’s not strange. On the US continent you will find so many of those small airports/airfields that many simmers will have no idea of their existence. 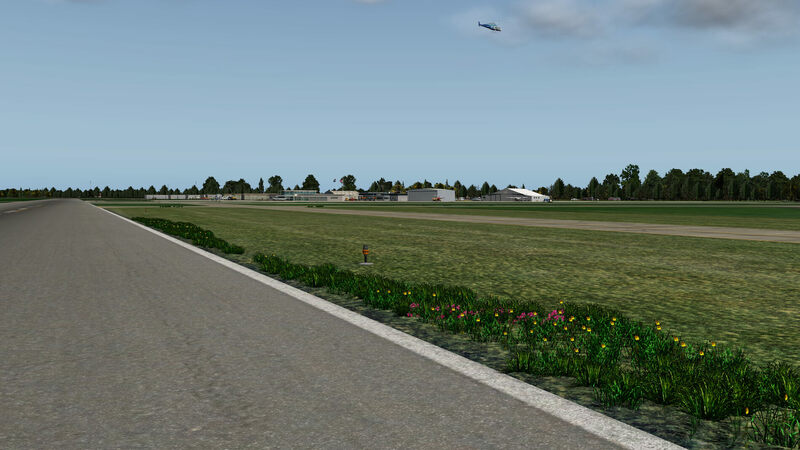 But with the recent release of KPVG from X-Plane.Org user Belga12345, your world will change when it comes to these tiny detailed developed airports. By the way, Belga12345 is the Org name for Marc Leydecker, who’s one of the NAPS (North Atlantic & Pacific Sceneries) team members or actually their Sketchup guru. Due to circumstances and a special request, Marc decided to develop his KPVG and I think I may say with success. – Animated work zone like working bulldozers, dump-trucks, etc. Quite impressive isn’t it? But the best way to appreciate all his work is to look and check it with your own eyes. I took the time to walk and drive at the airport and see it for myself. 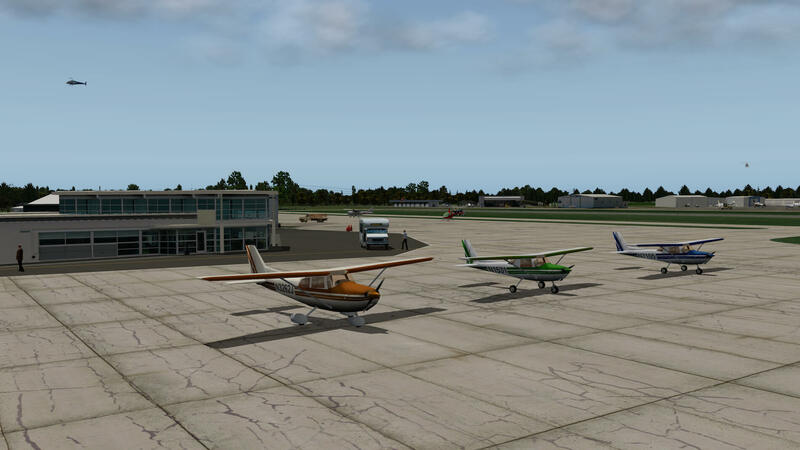 Result: a gorgeous freeware airport, and yes, you’re reading it right, a freeware airport with ortho scenery ground layers. 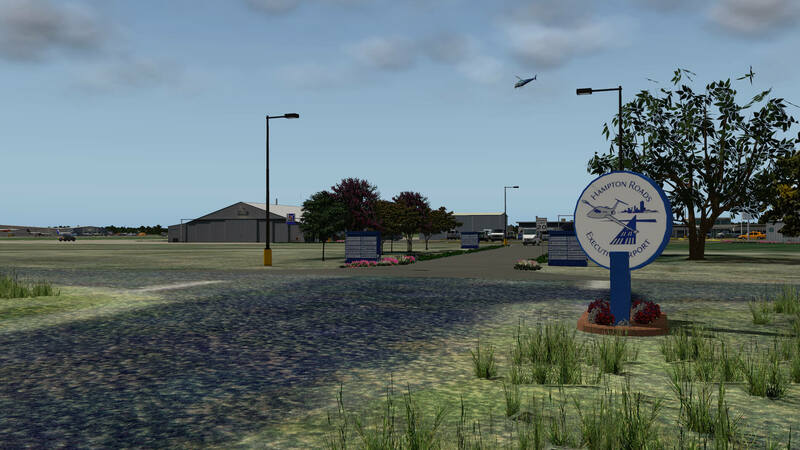 Hampton Roads Executive Airport (ICAO | KPVG) is a public-use airport located seven miles (11 km) southwest of the central business district of Norfolk and northwest of Chesapeake, both independent cities in the U.S. state of Virginia. It is privately owned by Virginia Aviation Associates, L.L.C. Although most U.S. airports use the same three-letter location identifier for the FAA and IATA, Hampton Roads Executive Airport is assigned PVG by the FAA but has no designation from the IATA (which assigned PVG to Pudong International Airport in Shanghai, China). Hampton Roads Executive Airport covers an area of 511 acres (207 ha) which contains two asphalt paved runways: 10/28 measuring 4,056 x 70 feet (1,236 x 21 m) and 2/20 measuring 3,524 x 70 feet (1,074 x 21 m). 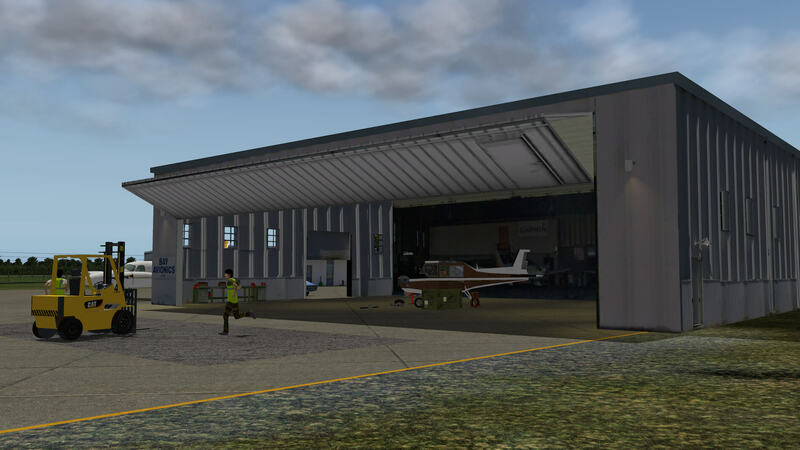 First of all, you can download Marc’s KPVG at Aerosoft via this link and at the dedicated X-Plane.Org web page. The installation is very simple and straightforward. Unzip the package and copy it to the Custom Scenery folder. Further on, you only need a copy of OpenSceneryX 2.0.0. If you don’t have this yet, then use this link (https://www.opensceneryx.com) to grab a copy for your Windows, Mac OSX or Linux. 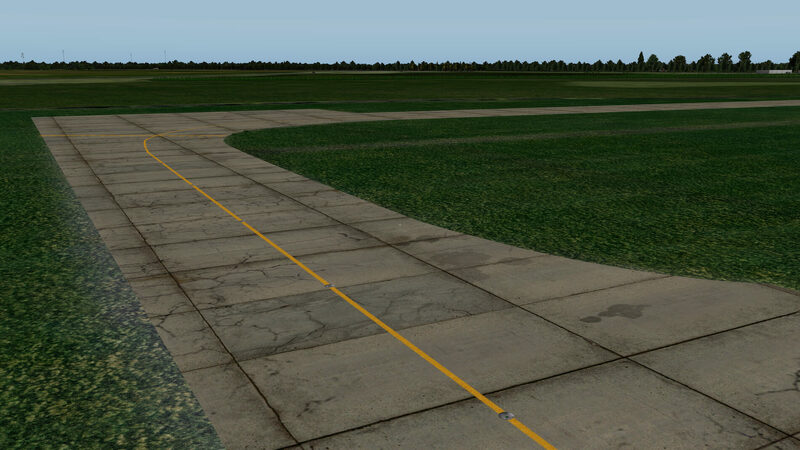 Last but not least, make sure you have “runway follows terrain contours” disabled. Next it’s time to familiarize yourself with the airport diagram and other airport data. Marc has thought about that and therefore you’ll find in the airport package a folder named “_documents”. This folder offers a lot of airport background information like where to find the airport boundaries, airport diagram, identification of the hangars and buildings and some official airport data, based on the airport layout as per June 2014. What can be found at the airport? Parallel along runway 28-10 you can find the W Military Highway. In-between this area you’ll find the main terminal with the large photo-real apron and to the right of this several handmade hangars. On the left side of the main terminal and apron you first need to cross the smaller runway 02-20, and then you approach the large GA (General Aviation) apron with all different handmade hangars. Normally you would expect some Lego Brick components, but Marc’s KPVG is only filled with handmade buildings, boxes, containers, hangars and much more. Better to say that his airport only uses handmade objects. Although KPVG isn’t a large and complex airport, the amount of handmade objects is huge. Actually, Marc told me that he made many more objects and animations, so much so that the frame rate hit was causing the dreaded “slide show”. That said, Marc had to remove some of those awesome objects and animation to get the frame rates on this airport back to normal. I think it’s time to visit Marc’s KPVG creation. Ready to join me at his airport? 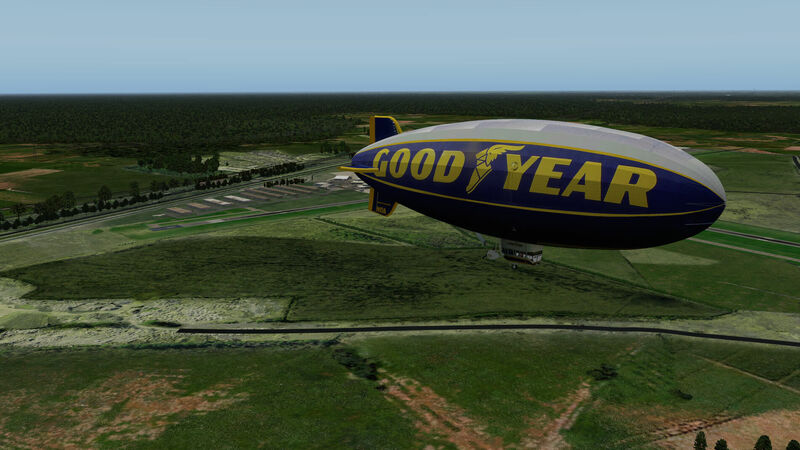 I could simply start with a walk-around at the airport, which I normally do, but this time I would like to invite you for a ride in the Goodyear Zeppelin which just happens to be over the airport at a nice convenient altitude. 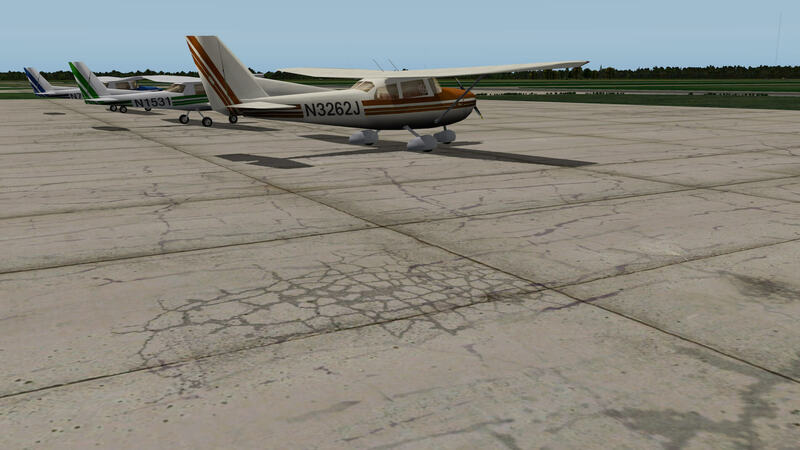 As you see on the above four screenshots, the whole airport comes with HD ortho photo ground textures. From the sky this gives the airport a realistic look and it’s well blended with the surrounding area. 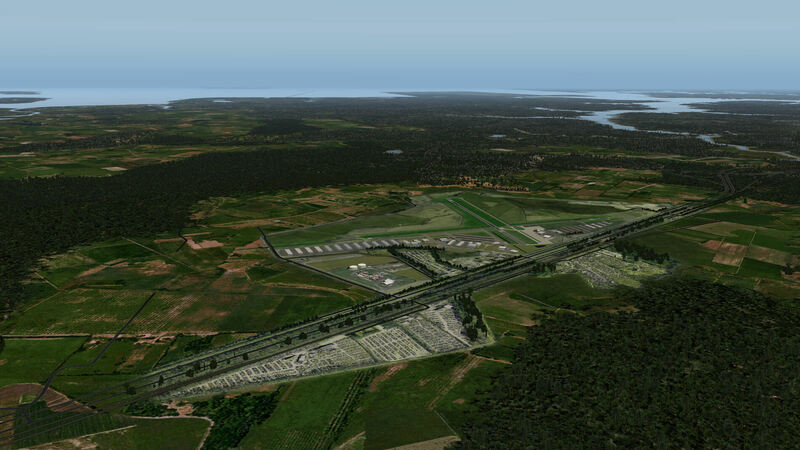 In case I forget; I tested this airport with a clean configuration of XP10.25 and later also with X-Plane 10.30b7. That said, there are no scenery enhancement programs installed, like for example from alpilotx “HD Mesh Scenery v2” or any others. Anyway, even from this Zeppelin altitude the airport looks very interesting and I think there’s no time to lose checking out all the aprons, buildings, offices, objects and whatever else there is to be found on the ground. 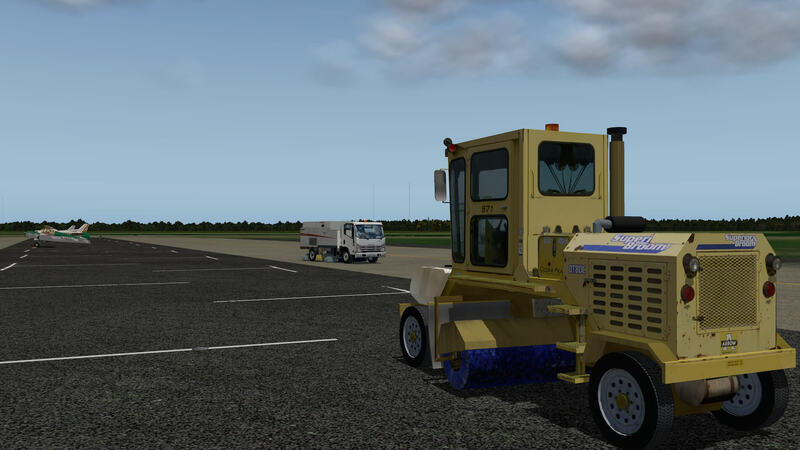 Nearly all objects in and outside the airport are handmade and thus modeled by Marc himself, excluding the static aircraft on the aprons which are part of the default OpenSceneryX objects. It all begins when you enter the airport via the main entrance. 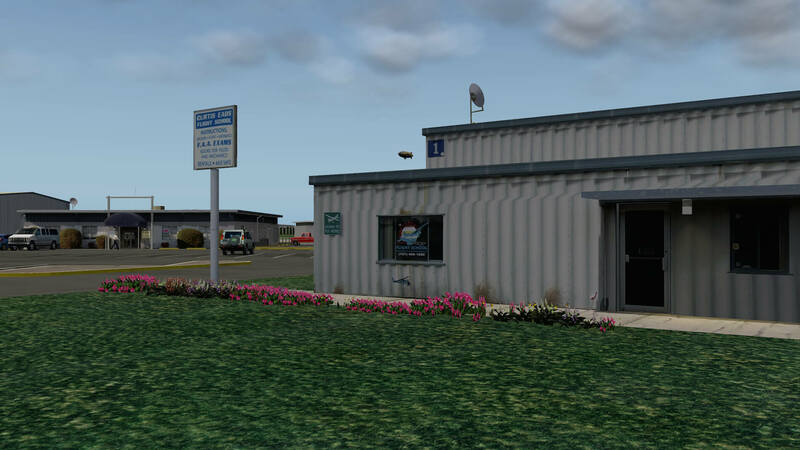 While driving onto the passenger terminal, you’ll find on your left and right side handmade buildings that do resemble the real airport buildings or offices. 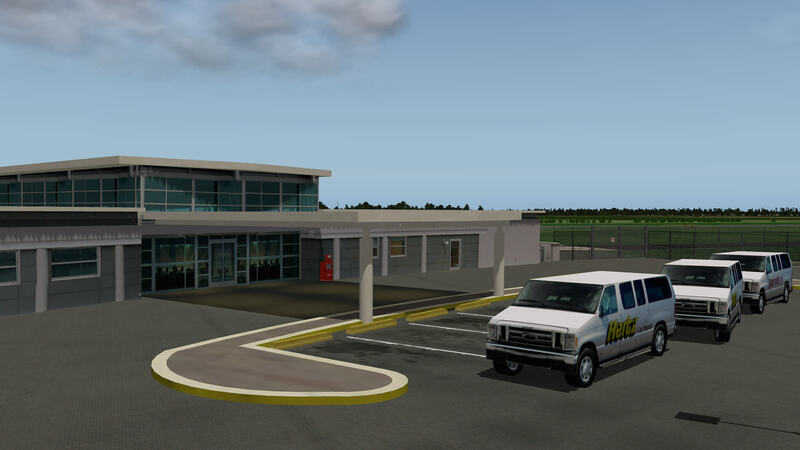 Seeing the handmade passenger terminal, I can only say that it impresses me and, although this isn’t a huge building with many jetways, it’s small, elegant and very well modeled. How well modeled? … As real as it gets. By the way; the first screenshot is the real terminal. 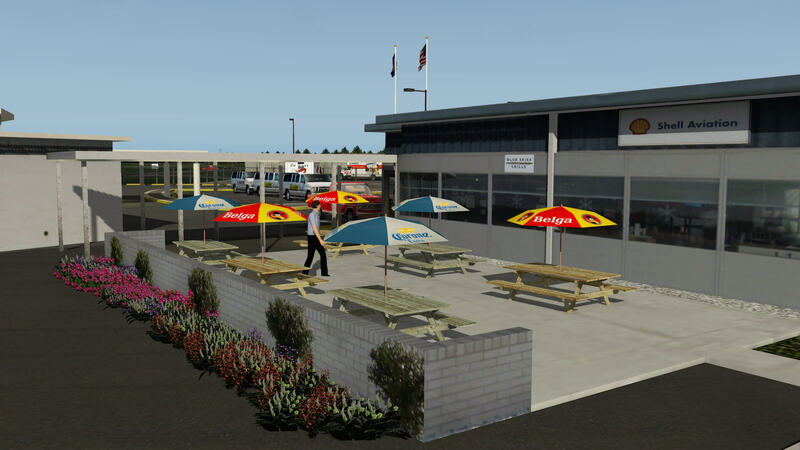 Even the small restaurant with outside seating facilities next to the passenger terminal is a pleasure to sit for either a drink or a small meal. 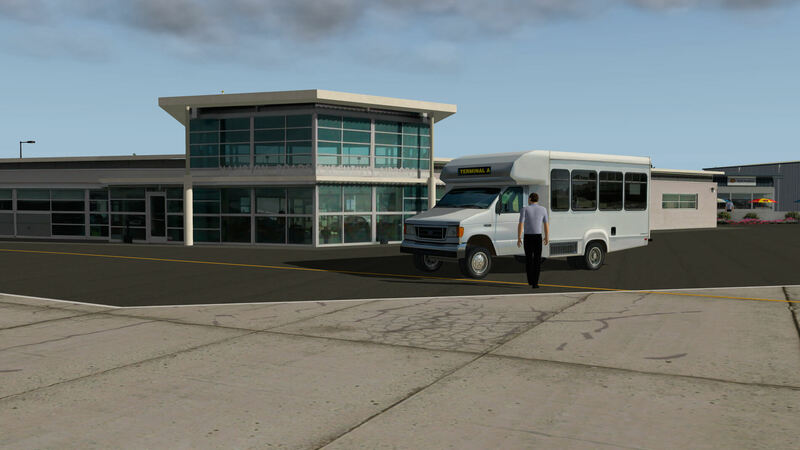 In front of the passenger terminal you’ll find a passenger bus bringing the passengers to/from their business jets. Another interesting item is the concrete apron textures. I’m not 100 percent sure, but I suspect the apron is a compilation of ortho photo material. Is it real? Take a look at some real airport pictures and you’ll see the result and know immediately that this is truly “as real as it gets”. Standing with your back to the passenger terminal, you’ll see on your right hand side two additional handmade objects from Marc. 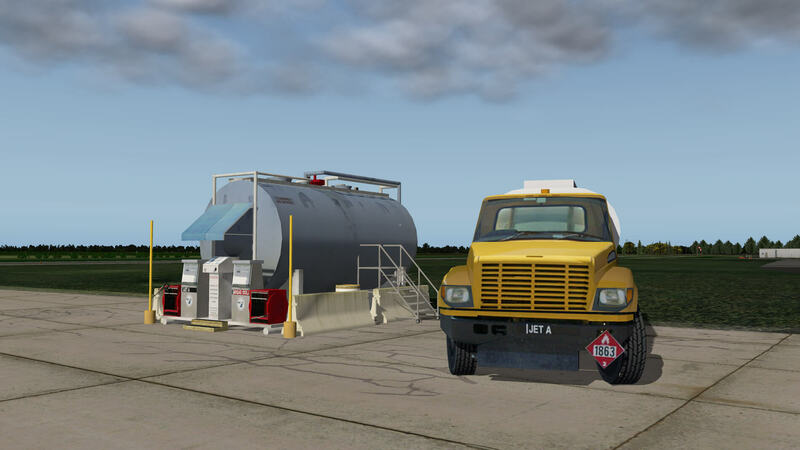 It’s a SHELL fuel truck and next to that, an AVGAS 100LL and JET A fuel station. Walking from the main apron to the right, you’ll find parallel with one another several hangars or storage buildings. All are covered with photo-real material giving them a realistic look. 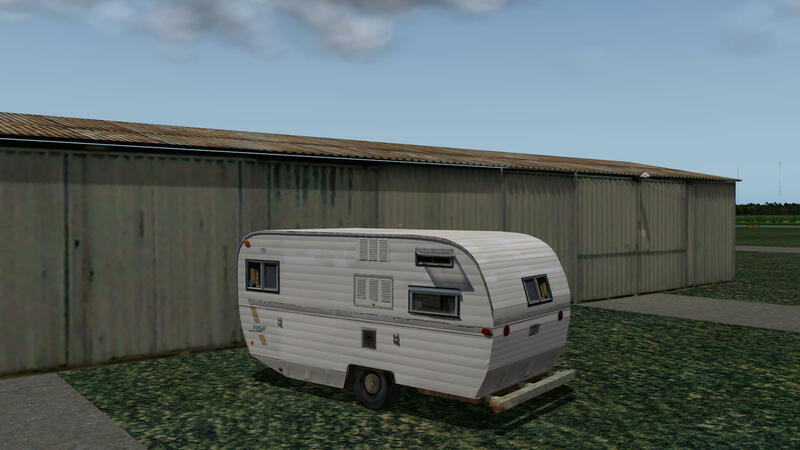 In between one of these hangars you’ll find an old Caravan which is, as expected, covered with photo-real material. A little further on you’ll find some containers and a U-HAUL truck, but more interesting are the objects near these hangars in the field, all handmade objects by Marc. 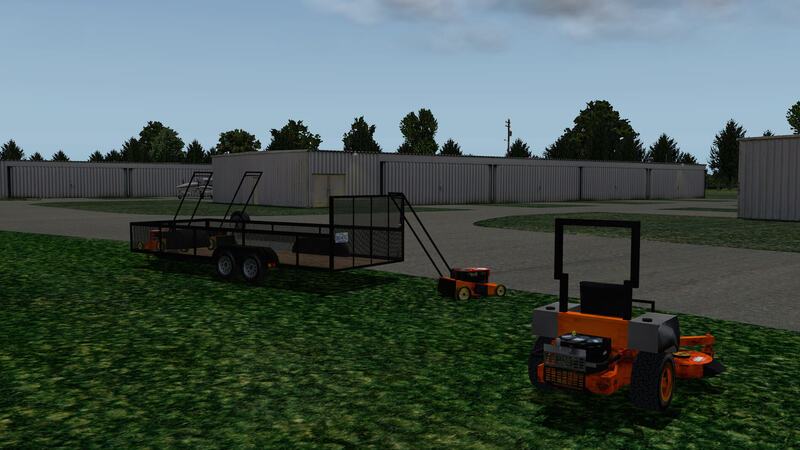 The handmade trailer and the four grass cutters are really gorgeous! While walking back to the passenger terminal, and crossing runway 02/20, you’ll find another busy and complex area of the airport. According to Marc, all are handmade objects including the many buildings, offices, hangars, the Super Broom surface cleaners and different construction machines. Honestly, there’s a little too much made by Marc to mention them all. The GA (General Aviation) apron is, compared to the passenger apron which I previously discussed, much larger. But it is also of high quality and at certain places photo real ground textures are used to create a realistic impression. 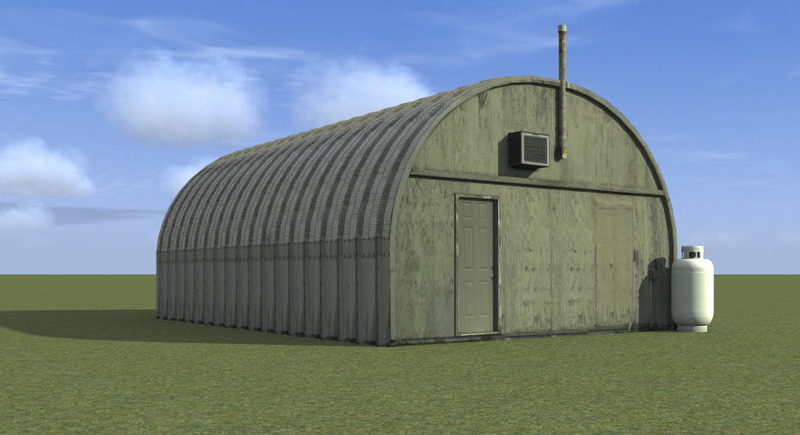 Although the hangars are basic looking buildings, they are all handmade and so true to the real hangars. I found a hangar that’s really worth a check out by you. 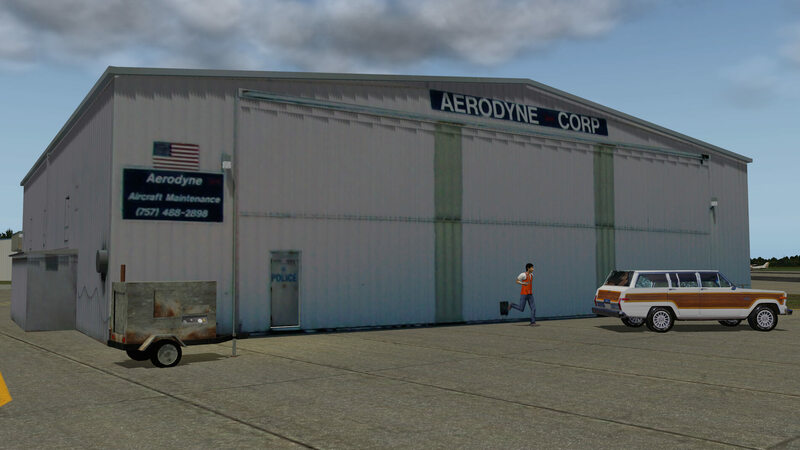 It’s the Aerodyne Corp. hangar which is a nice example of great modeling. Marc, my compliments! And while there, have a look at the activities that can be spotted at the BAY AVIONICS LTD. hangar. 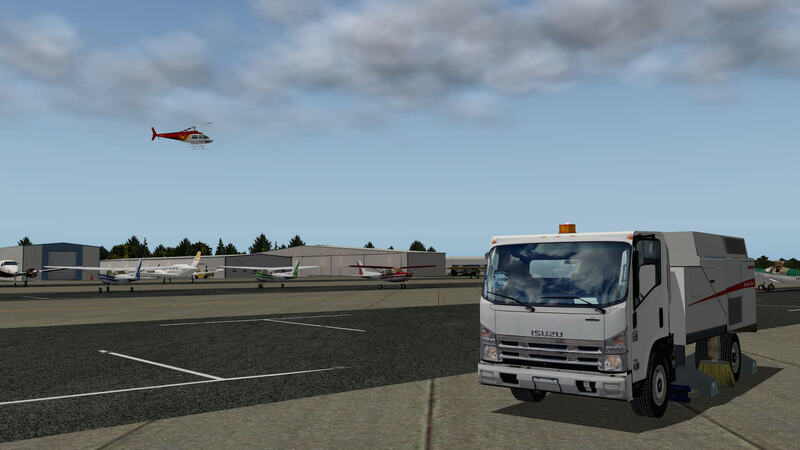 I decide to walk back to my starting point at the beginning of the GA apron. This time I walk back via the road which runs along the back side of all the hangars. 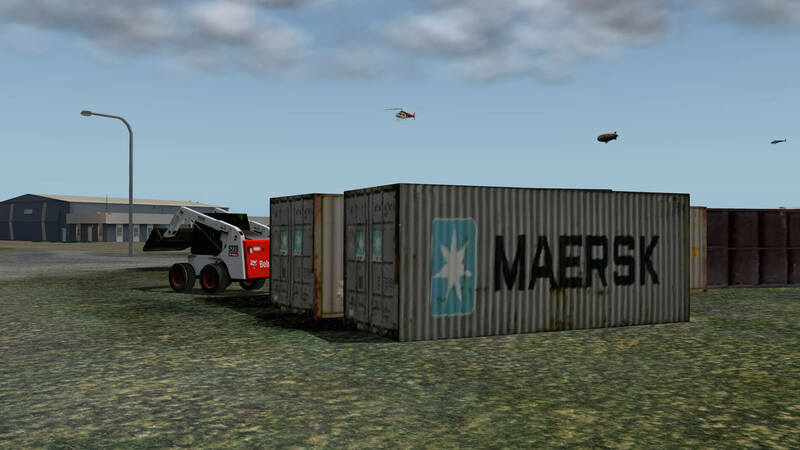 At a certain point I see on my left hand side some ship containers, one of which is from MAERSK. Next to this container I spot a typical American Caravan or perhaps just a “van”. At this location I see some 3D grass and the reason I mention this is that this is what I miss on more spots at the airport. Perhaps one reason why Marc didn’t include more 3D grass was to prevent a serious hit on frame rates. But I have to be honest. During my drive around the airport I do see some green bushes, so it’s not only flat ground textures, but I expected a little more 3D grass. Sitting in the company car I drive back to the passenger terminal, turn onto the public area, located in front of the check-in side of the terminal. From here I start walking around this area. In front of the passenger terminal and the restaurant there’s a small parking area which is filled with some cars. 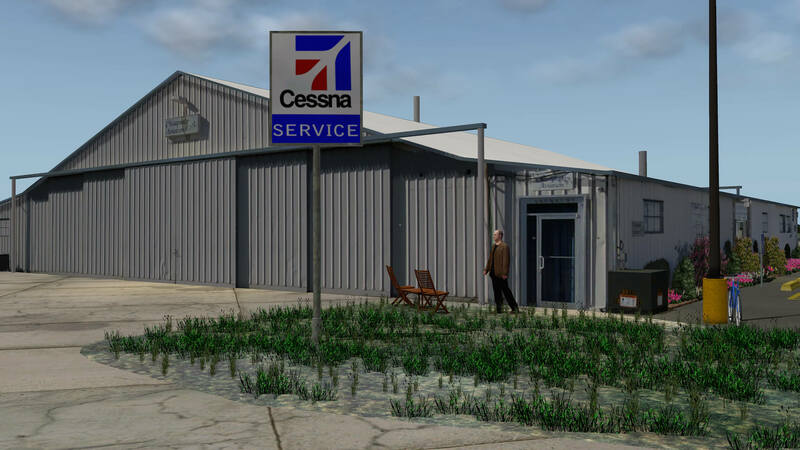 One of the first buildings you see at the entrance is a Cessna Service hangar; expect a nicely modeled 3D object on the right hand side of the entrance road, “Curtis EADS Flight School” office. Before you enter the parking area, you’ll find on both sides of the road four blue/white signs with “what and where” to find the hangars, buildings and offices. Oops, almost forgotten … animations and other interesting objects. Although Marc’s creation represents a small airport, it’s full of handmade objects and animations, and I know that I’ve forgotten some of them. On the other hand, when I’ve forgotten them, it’s a challenge for you to find them. At the airport you’ll find several animated helicopters. 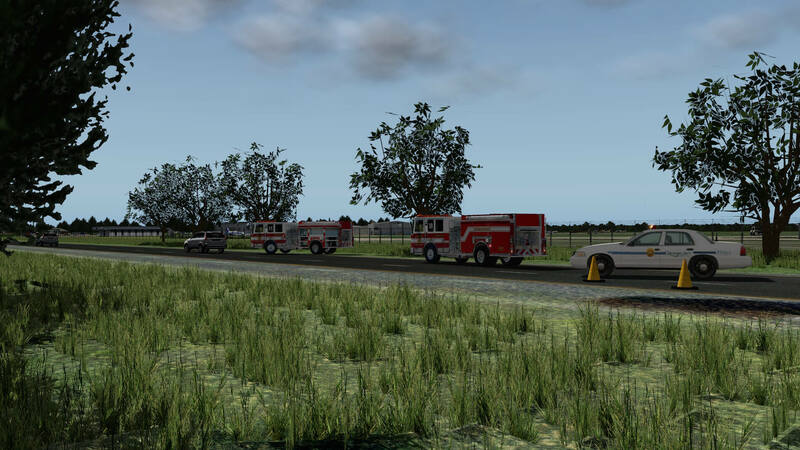 Let me give you an example: the WAVY10 NEWS blue helicopter that is parked at the main apron in front of the passenger terminal takes off and circles over a car accident on Military Highway and lands back again in front of the terminal. Further on you will see many animated airport vehicles. And remember what I said in the beginning, most but perhaps not all of those static and animated objects, other than the GA aircraft, are all modeled by Marc himself. Hold on, I forget something important; the gas station Kangaroo. Take a look inside. Everything is modeled from the cigarette stands to the coffee machine and refrigerators! Is this all and did I cover every corner of the airport? 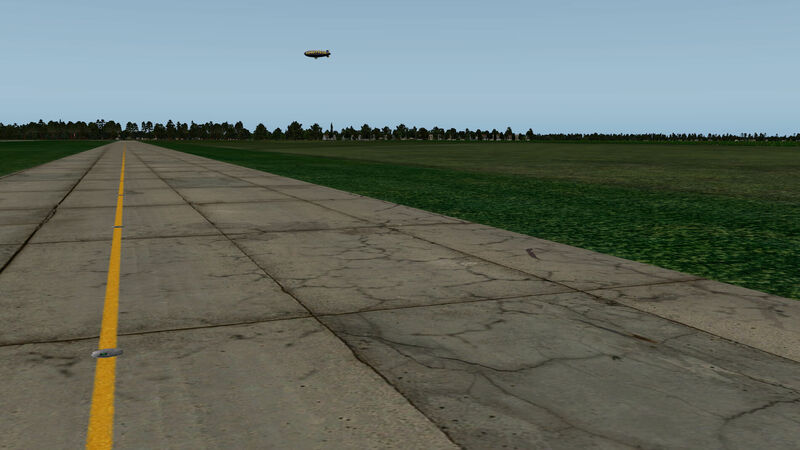 Besides the ground textures, taxiways and runway which comes later, for sure I have missed a couple of objects. On the other hand, view this impression as a help to bring Marc’s airport to your attention. I highlighted this already at the beginning of this impression. 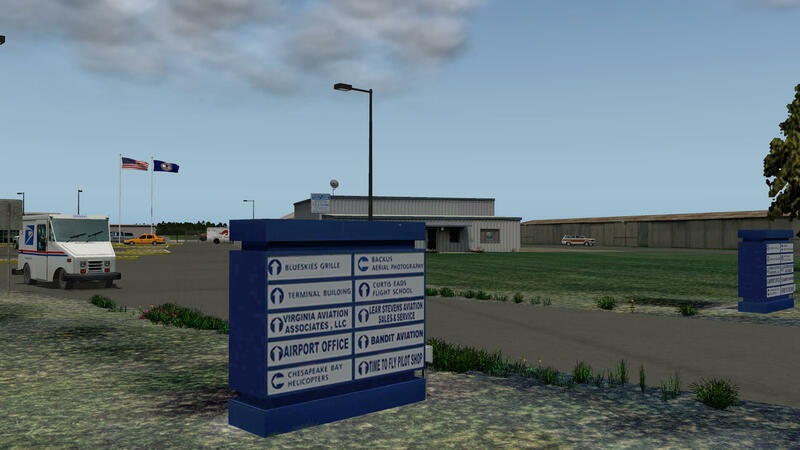 Marc not only created a highly realistic airport with an enormous amount of handmade objects, he also added to this airport ortho photo ground textures. That means that Marc’s KPVG gets the look we’re looking for; as real as it gets! This also means that the airport has a great look from the air while arriving. Default ground textures as used in XP10 aren’t always realistic. Therefore, I encourage every freeware developer to add to his or her airport ortho photo material, if of course available. Just check out the following screenshots that should give you a good idea of the implemented ortho photo ground textures. Other than the ground textures, I’m also happy with the taxiways and runways lining. Wherever applicable, aprons are covered with real photo material. That gives these concrete areas a gorgeous look. Marc had the chance to read the contents of this impression before publishing. Due to this, Marc would like to give you some additional background information about how he decided to make things. Ready? The default X-Plane textures are too bland and do not give the airport it’s “character”. Like most secondary airports (on a limited budget) ramps and taxiways are continuously patched. There are some great aftermarket textures available for X-Plane, both freeware and pay ware, but they change the default textures. Thus the weathered and patched textures would now become the default for every airport in X-Plane. I could have used the ortho photos, but they become blurry if viewed within 200 feet. 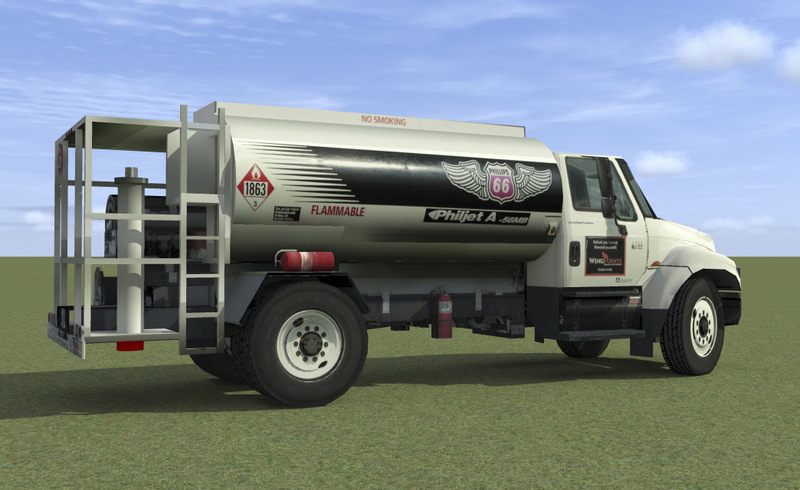 I had some great aerial photos of the “tarmac” and created based on this my own “seamless” textures in Photoshop. I think I have 4 different asphalts and 4 different concretes. These were transformed to POL files and overlaid the existing ramps and taxiways. Initially, the whole airport was covered with 3D grasses, wildflowers, etc. Wherever the airport was “busy” with other objects or animations, the frame rate would suffer badly. The testing was done on my hi-end laptop. So do you make the ultimate airport for a few simmers or do you compromise and make it usable for a bigger crowd? I took the 3D grass away from the areas it impacted the frame rate the most. Now that looked like patch work and was ugly. 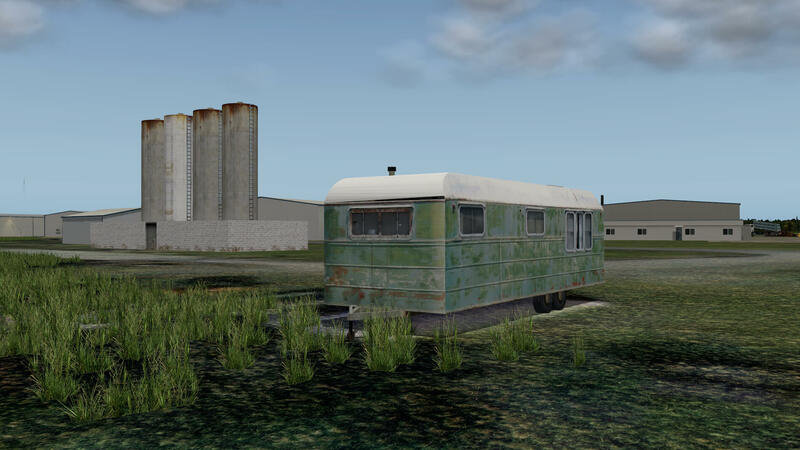 The grass was replaced by what they call a “decal” which is only visible when nitty gritty textures is clicked in your settings. I placed some grass patches in a couple of strategic places. Not what I wanted but …. oh well! Marc would like to share with you some KFYJ (Middle Peninsula Regional) WIP screenshots and background information of KFYJ. 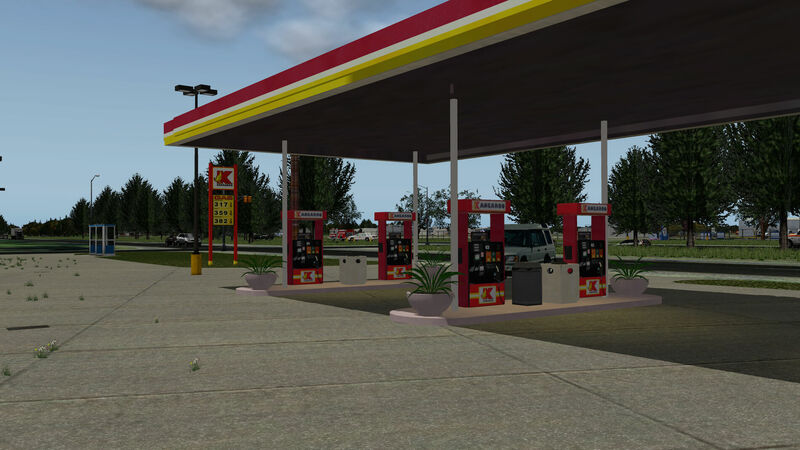 For example the gas pumps; all relays, pumps, motors, valves and wiring are accurately modeled in 3D. No more default GA aircraft. 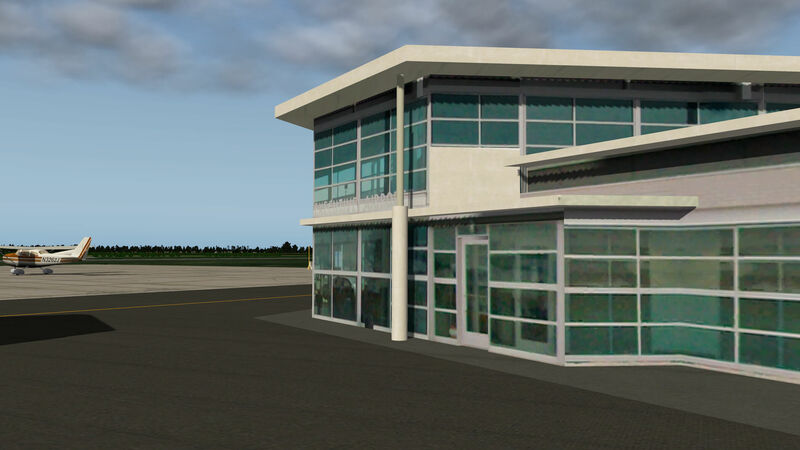 With authorization from Alabeo, the airport will feature fully animated custom made models based on Alabeo’s original design. The Medivac Helicopters are modeled from scratch in Sketchup and will be animated too. Custom made weather station, airport beacon, cell phone towers, …. yes even the trashcans and much more. 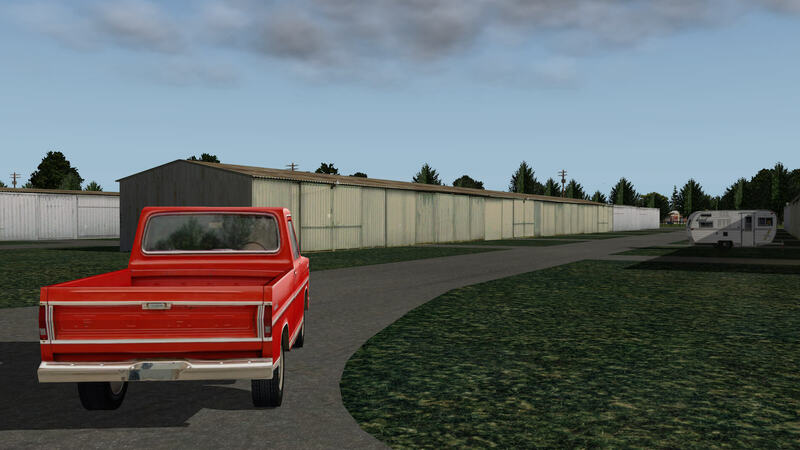 Check out these WIP KFYJ screenshots. I had the opportunity to talk with Marc far before his actual airport KPVG release. That said, I think it’s worth, when you have the time and interest, to read our article “Spotlight … KPVG with SketchUp”. In this article Marc explains a little more about himself and his struggle and success with Google SketchUp. I hope you liked the impression and if so, I would say try out Marc’s KPVG. 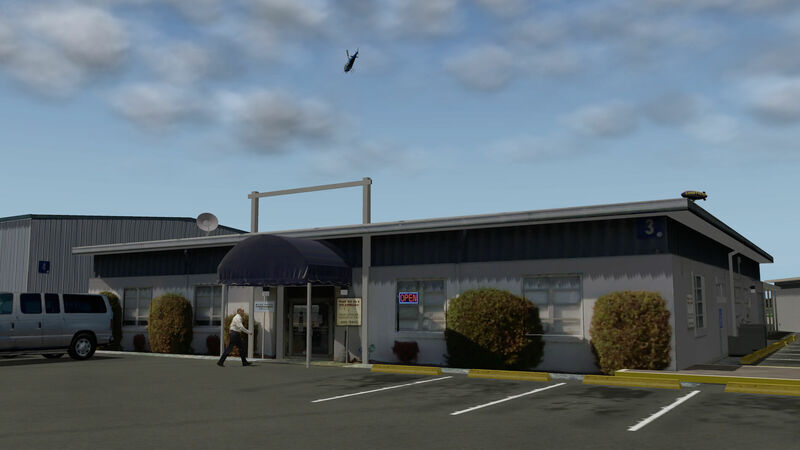 As mentioned in the first section, you can download Marc’s KPVG at Aerosoft via this link (https://forum.aerosoft.com/index.php?/files/file/2767-kpvg-hampton-roads-animated-hd-photo-realistic-airport-10/) and at the dedicated X-Plane.Org web page (https://forums.x-plane.org/index.php?app=downloads&showfile=23312). 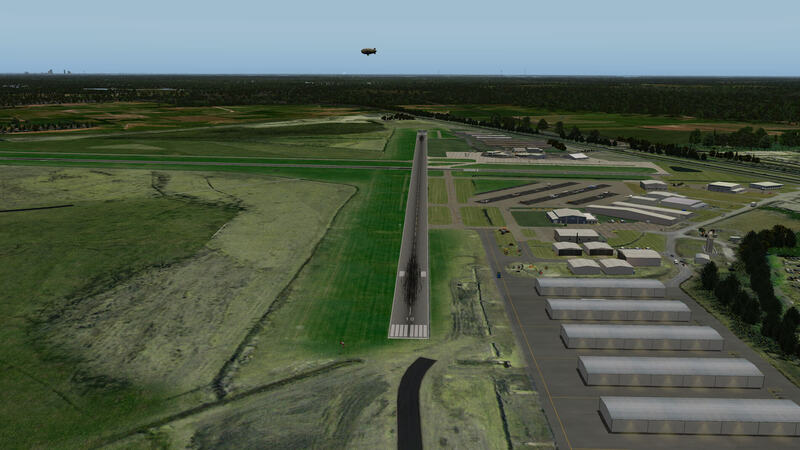 I tested Marc’s airport with XP10.25 and XP10.30b7. 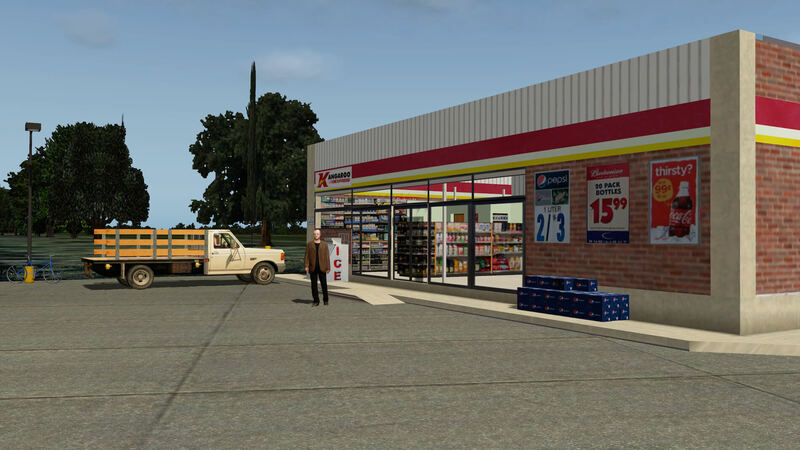 Both X-Plane packages are clean installations so without any other scenery enhancements. 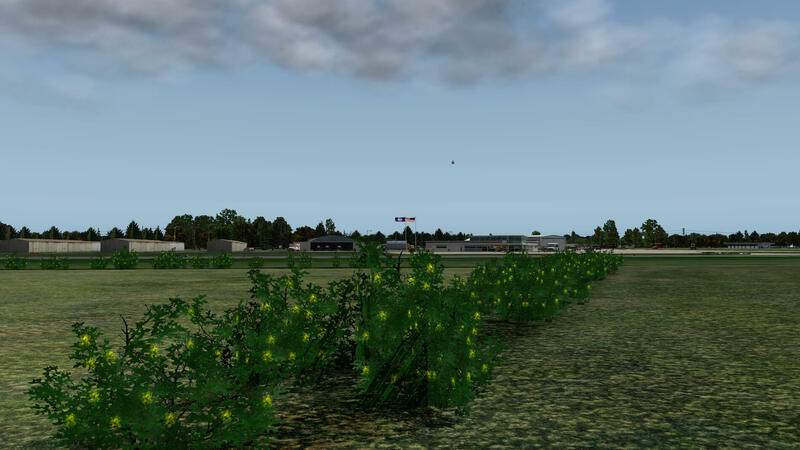 The screenshots in this review are made in X-Plane 10.30b7 with a Gamma of 1.5.